So if you’ve been watching crokinole videos you’ve been exposed to a significant amount of crokinole terminology. But like learning a new language, or even the local hometown slang, many words and phrases can seem undecipherable and take a long time before they become fully understood. For your convenience, below is a list of commonly used crokinole terms, and their corresponding helpful english definition. Like any good dictionary/glossary/terminology, attempts will be made to keep this listing informational and modern, so feel free to offer suggestions. The updated page can be found here. Credit to CrokinoleDepot for the templates used to create the diagrams in this glossary. Description - A crokinole disc counting for 20 points, after having been shot and lying flat in the centre recessed hole of a crokinole board. Description - An attempt at scoring a 20 that involves deflecting off of another disc so that the shooting disc is directed at an angle into the 20 hole. 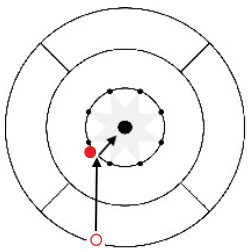 Short-angle and long-angle are often used to describe the distance the shooting disc has to travel to the 20 hole after deflecting off another disc. Description - Another term for scoring a 20, derived from the fact that the 20 hole is found at the centre of the board. The term is commonly used in Eastern parts of Canada. Description - An attempt for scoring a 20 of extreme difficulty that often involves numerous fortunate deflections off of pegs and discs to be successful. Typically a “last ditch effort” used when no reasonable options exist. Description - When an opportunity for an Open 20 is available, a shot intentionally taken so the shooting disc will come to rest in a location where a 20 cannot be made by the opposition. Definition - A condition that can affect crokinole players, severely damaging their performance, often manifesting in an inability to release the shooting hand to complete the flicking motion. It can be compared to “dartitis” which famously impacted professional dart player Eric Bristow, or “the yips” which is a term used to describe the loss of fine motor skills without any explanation. Description - A game known well and with a long history in rural Canada and the Northern United States, though absent from most dictionaries, with no clear idea of the derivation of its name. Description - A method used in many non-competitive games to determine who will shoot first in a round. Each player takes one shot towards the centre, with the player with the closest shot to the middle (perhaps by scoring a 20) getting to start or getting to choose who will start. Origin - Possibly darts, where some English literature from the mid 1950s references the phrase “diddle for the middle” or “middle for diddle” when describing the beginning of a darts game. Description - The recessed and outer most ring of a crokinole board, outside the surface of play, where all previously removed discs in a round remain until completion of the round. Description - A shot attempt in which the shooting disc is to come to rest near another disc or peg in order to make the disc very difficult to be removed from the board. Description - A shot where a player’s disc is intentionally left behind a peg or collection of opposing discs and pegs, so that the opponent’s attempt at contacting or removing that disc will be particularly difficult. 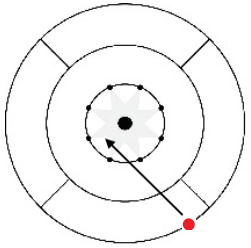 Description - A shot where the shooting disc hits or removes another disc, and then continues in motion to slide into another location on the board. Description - A shot where the shooting disc hits or removes another disc, and stops without moving after contact is made. Description - The treacherous and most difficult passage of the crokinole board that involves a disc traveling down the narrow passage between a total of four pegs. In Joe Fulop’s book, “It’s Only Crokinole but I Like It” he references this shot as “going through Hogan’s alley” and then states “I don’t know where the expression came from.” There are numerous uses of the term throughout recent history, including an 1890s comic strip, a 1984 video game, an old alley in Vancouver, and an FBI training facility opened in 1987. The crokinole usage most likely comes from legendary golf player Ben Hogan, who so thoroughly dominated throughout his career that 2 US golf courses are now known as “Hogan’s Alley.” However, the most analogous connection to crokinole is that of hole #6 of the golf course in Carnoustie, Scotland. In 1953, Hogan won the British Open after successfully using the more dangerous left fairway of the split-fairway hole #6 on all four days of competition. The hole became known as “Hogan’s Alley” before officially being named as such in 2003. Description - Another term for the 10/15 line, where in the case of no opposing discs on the board, the shooting disc must at least touch or exceed to be a valid shot. Origin - Sport of Curling, as shots not reaching the hog line in curling are invalid. Description - The entire circle encompassed by the 10/15 line, where in the case of no opposing discs on the board, the shooting disc must remain in to be a valid shot. Common Use - “The disc rolled outside of the house." The left Joe Fulop shot. Description - A ricochet 20 scored off an opposition disc that is sitting directly in front of the shooter’s side-left-near peg or side-right-near peg. Description - A disc that is lying on an angle, or leaning, partially resting on the bottom of the 20 hole, and partially resting on the edge of the 15-point surface. Description - The 15 circle surrounded by pegs. Description - The 5 and 10 point zones, outside of the middle 15 circle and pegs. Description - A takeout that removes a disc, while also removing the shooter from the board. Often used when the opposition has a lead and a disc on the outer edge of the board, so that play can be forced back into the middle. Description - A disc that is either resting next to a peg and difficult to remove, or is very likely to be directed into a peg after attempting a takeout at a particular angle. Description - When a player completes a round scoring every 20 possible (example 8 20s made out of 8 shots). While “Perfect Round” is the accurate term, a player’s exuberance after completing one allows them to be forgiven for incorrectly naming the achievement. Description - When a disc stops or changes course abruptly and without clear reason for doing so. Description - A shot where the shooting disc is directed into another of it’s own colour in order to move that disc closer to the middle or to an increased scoring area. 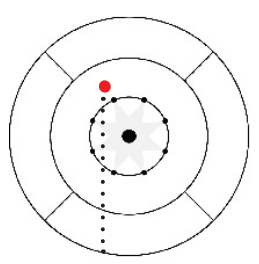 Description - A 20 attempt in which the shooting disc first makes contact with an opposing disc, and then proceeds to bounce off a peg into the 20 hole. Description - A shot that rebounds or deflects off of another disc. A ricochet 20 describes a shot that deflects off an opposing disc before scoring a 20. Description - A shot where the shooting disc removes an opposing disc, and then proceeds to slide to a location that makes it very difficult for an opponent to score a 20. Typically the intention of the shot is to have the shooting disc roll away from the 20 hole. The use of this shot is noticed particularly when a “Hit and Stick” would leave an easy shot for the opponent to score a 20. Description - A shot where the shooting disc attempts to contact only a small portion of the outer edge of an opposing disc in order to cause a very slight change in the direction of the shooting disc, and usually leave the contacted disc in nearly the same position. Description - Any points scored in a round where the opponent has the hammer. Description - A shot where one disc removes another from play. This can be made on multiple discs (“double takeout" or “triple takeout”) or while scoring a 20 (“takeout 20”). Description - The most important details of the score of a crokinole round, namely how many 20s have been scored by players/teams, and who has the hammer. Commonly clarified with partners during doubles matches. Description - A 20 attempt in which the opposing disc is contacted minimally before the shooting disc enters the 20 hole. Description - When a player completes a game where every round was a Perfect Round. Special Note - The first player to do this on camera earns the naming rights to the True Perfect Game.